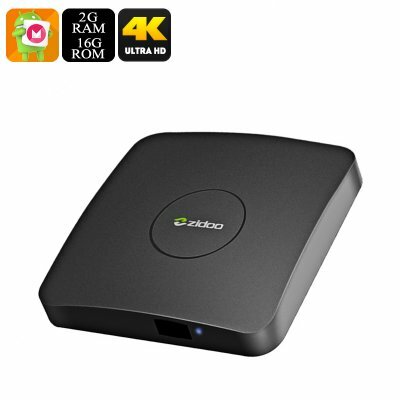 Successfully Added ZIDOO A5S S905X TV Box - Android 6.0, Quad-Core CPU, 16GB, Kodi TV, Google Play, Airplay, 4K Support, Miracast, 2GB RAM to your Shopping Cart. Bring countless hours of fun and entertainment into your household with the ZIDOO A5S S905X Media Player. From now on you’ll be able to throw amazing movie nights for all your friends or simply enjoy an online game on your big screen TV while enjoying a relaxed evening at home – with this Android TV box your entertainment options will be limitless. Coming with an Android 6.0 operating system, you can be assured that you’ll be treated with an incredibly fast and powerful performance, letting you launch the most demanding of applications and games within the blink of an eye. Play games, watch movies, or simply browse the web – nothing is too much for this powerful Android media player. Supporting 4K resolution, this Android 6.0 TV box provides you with absolutely stunning visuals and detail – allowing you to enjoy your favorite movies and series in ultra-HD resolution. Along with its stunning Penta-Core ARM Mali-450 graphic’s card, you can be assured that you’ll be treated with the highest range of graphics and vivid colors while enjoying your media on this Kodi TV box, truly letting you take the most out of your upcoming entertainment experience. By supporting both Google Play and Kodi TV, this Android TV box gives you free access to millions of the latest games, TV Applications, movies, and a whole lot more that now, thanks to the powerful hardware this media player is packing, can be enjoyed in absolutely stunning beauty. With its Quad-Core processor that has been clocked at 1.5GHz and 2GB of RAM, this Android 6.0 TV box lets you engage in the most demanding of games and multitasking sessions out there. Packing 16GB of internal storage and providing the added possibility to insert 32GB of memory externally, this smart home accessory offers oceans of space for you to store all your favorite media that can now be enjoyed at any time of the day. Whether you like to invite over your best friends and enjoy an evening filled with online games, or simply enjoy a relaxed evening at home with your family watching a movie – this Android TV box offers the solution to all your needs and ensure that you’ll never have to be bored again. Thanks to its Airplay feature, this media player does not only allow you to pair it with your Android devices but, additionally, also lets you sync your Apple smartphone or tablet with this amazing Android TV box. Miracast furthermore allows you to effortlessly mirror anything happening on your smartphone onto your big screen TV - letting you to easily enjoy all your phone’s features on your state of the art smart television. Coming packed with tons of more features, this Kodi TV box is guaranteed to offer a stunning user experience that will bring along hour’s worth of joy and entertainment – making it the perfect asset to any modern household and office alike.